...that charming and graceful writer who has lately deserted the turmoil of literature for the peace of the House of Commons. I mean the author of Obiter Dicta. Augustine Birrell (1850-1933) was a barrister by trade who became a popular author in 1884 and then an elected politician in 1889. But he never deserted the turmoil of literature while he was in the House of Commons. Moreover, he may have been at peace in the House of Commons, but not so in the latter part of his years as Chief Secretary of Ireland. More on that later. So far as I could see there was no reason why I should not continue, though without much brightness of hope, to go down to my Chambers in Lincoln's Inn and return home at night to my sister and my library till the end of my days. 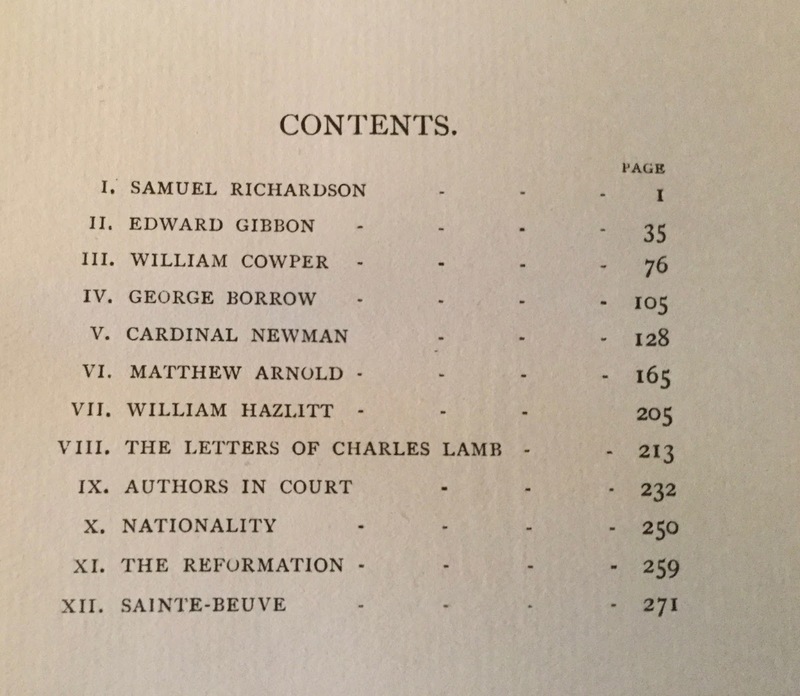 Essays on Johnson, Burke, Lamb, Emerson and more all in one book? Yes! I will note that I used a quote from Birrell's essay, 'The Muse of History," in a book of essays the Caxton Club published in 2011. More on that later. 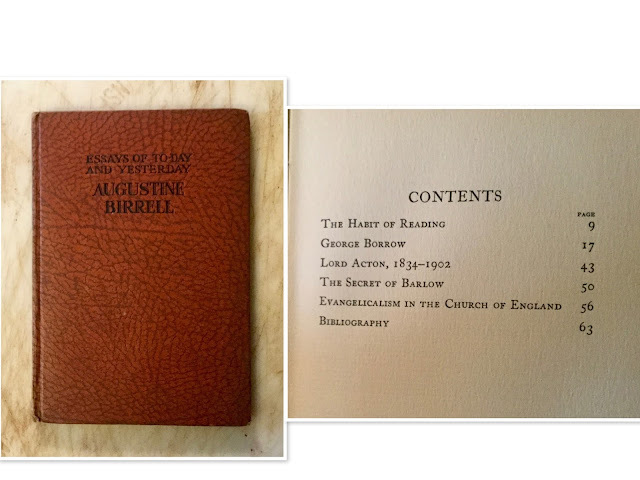 1887 was a good year for Augustine Birrell. 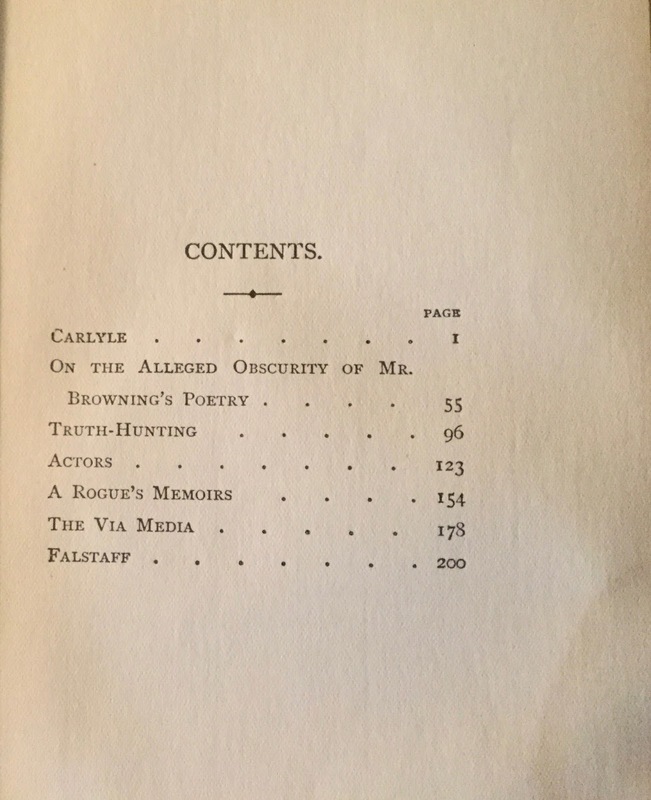 That was the year he met Eleanor Tennyson, neé Locker, the widow of Lionel Tennyson, Alfred Tennyson's son, and the daughter of the book collector Frederick Locker-Lampson. For Birrell, it was love at first sight. They were married a year later. As for his new father-in-law, Birrell was a book collector himself, with a library of thousands of books. So they got along splendidly! 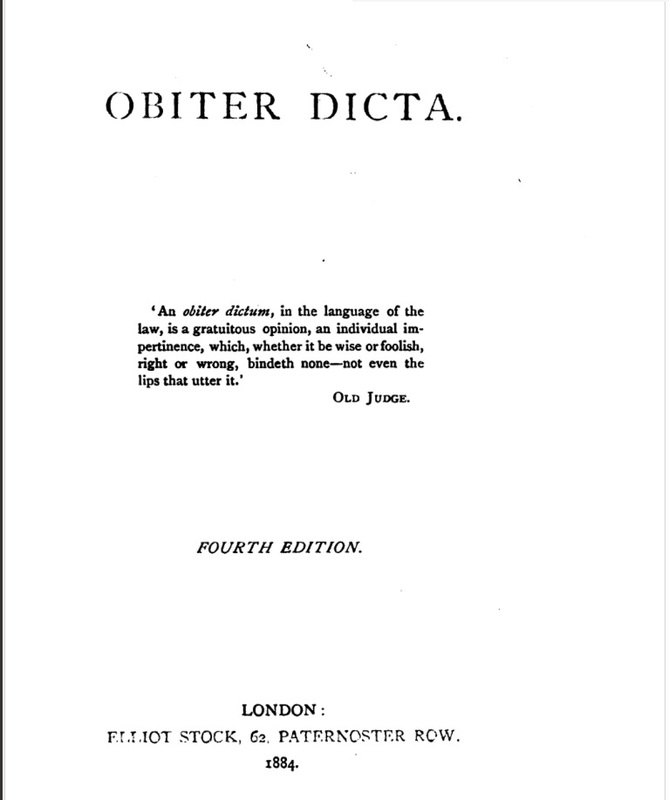 In 1892, Eliot Stock and Scribner's published Birrell's book, Res Judicatæ. My copy belonged to Kermit Roosevelt. And I wrote about the history of the book on this very blog in Feb 2013. 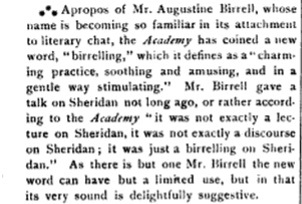 Birrell was popular on both sides of the Atlantic, as witnessed by the articles in The Academy in London, and The Literary World in New York. More than sixty years ago, Carlyle, writing in Fraser's Magazine, observed in that manner of his which has now become part of our incorporate existence, that the new edition of Boswell, then lately undertaken by Mr. Croker, was a praiseworthy but no miraculous procedure––in no way an event in universal history, and indeed in very truth one of the most insignificant of things. 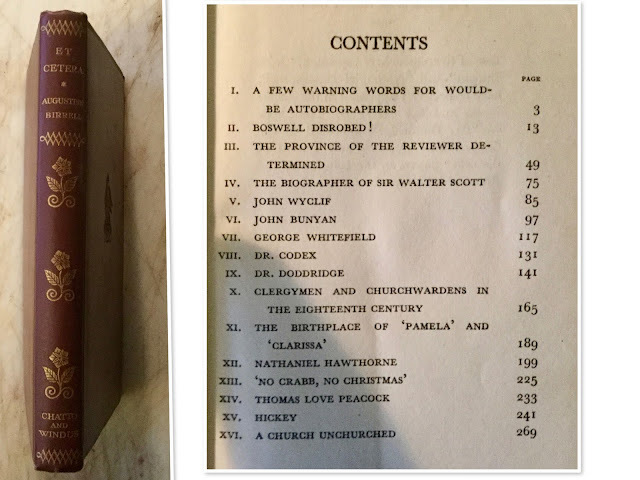 If that were true in 1832 of so pretentious an edition of Boswell's Johnson as Mr. Croker's, the insignificance of the present edition is almost startling. Boswell's immortal biography has been reprinted many times since the date of Carlyle's famous article, and in our immediate hour we have the advantage of re-reading it in the careful and interesting edition of the late Mr. Napier, as well as in the splendid volumes of my revered friend, Dr. Birkbeck Hill, whose eager and unresting toil and minute diligence has left scarce anything behind him for even the most humble-minded of gleaners in the Johnsonian fields. Orators, happily for us, differ so hugely one from another, that the only thing to do is what is done here––to heap them all together, the good and the bad; him whose course is fertilizing like that of a great river and him who runs glittering like a brook; the old and the new, from the East and from the West, and then to submit them as a whole to the judgment of mankind and the mercy of heaven. In 1917, August Birrell had 100 copies of Aphorisms on Authors and Their Ways privately printed, all aphorisms of which were taken from Johnson's Lives of the Poets. 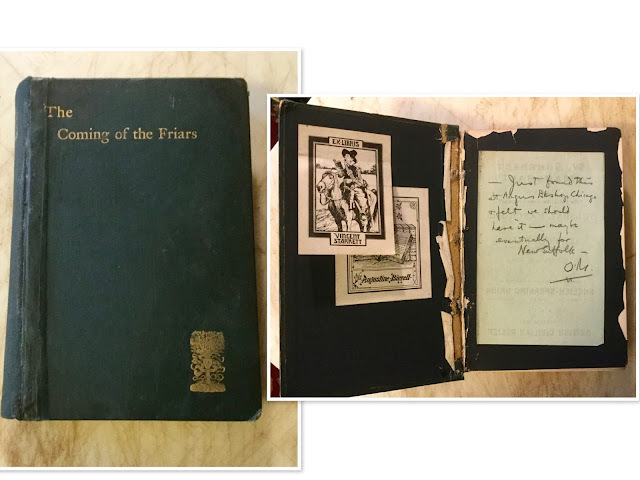 Birrell presented this particular copy to the "Dean of Norwich," the clergyman, author, and poet, Henry Charles Beeching (1859-1919). 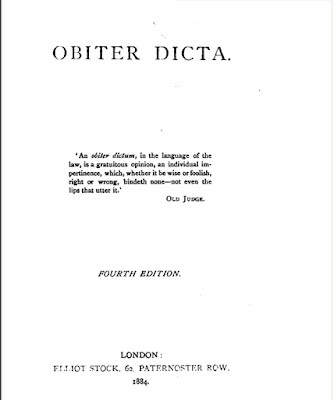 More Obiter Dicta was published in 1924. 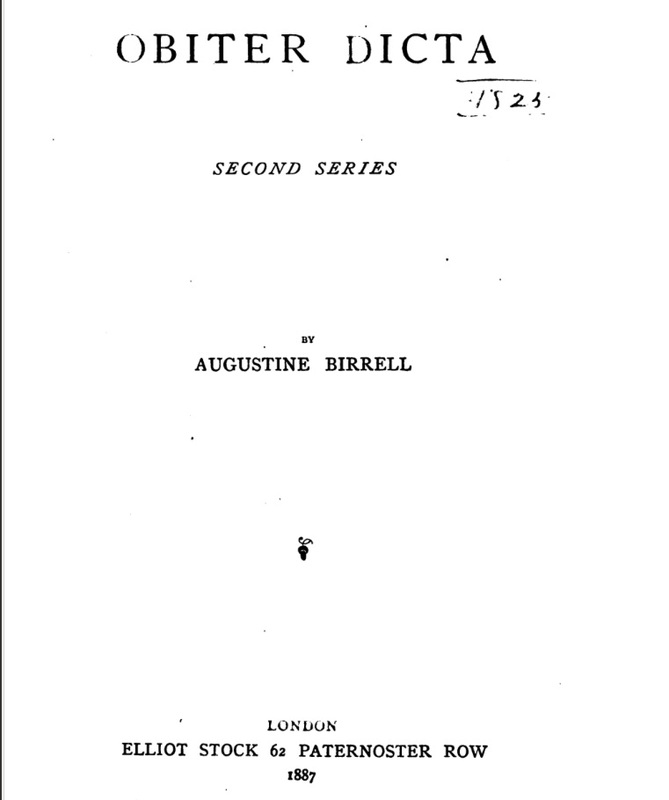 Birrell thought this might be his last book of essays and in the preface he "dedicated" the book to himself (this was the last book that he himself wrote the preface or introduction). All the essays were previously published in periodicals, but as far as I can tell, this is the first time the essays appeared in book form. 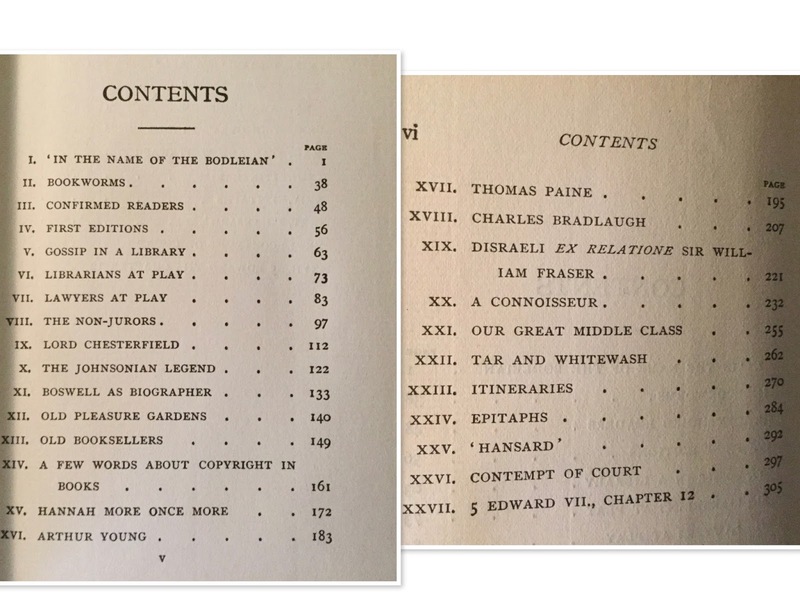 In 1926, George G. Harrap & Co. published several of Birrell's essays for its series, Essays of To-Day and Yesterday. 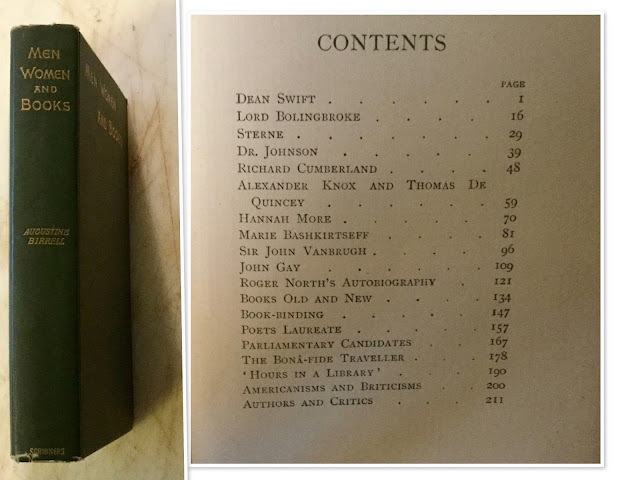 The essay on George Borrow appears to be the only essay previously printed in book form. 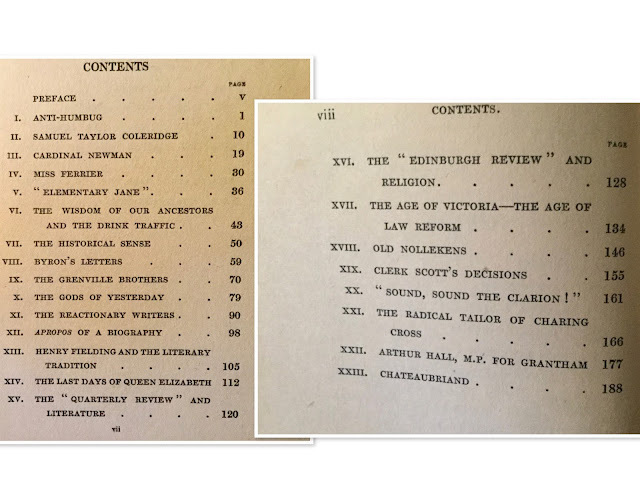 All the others were previously published in periodicals. 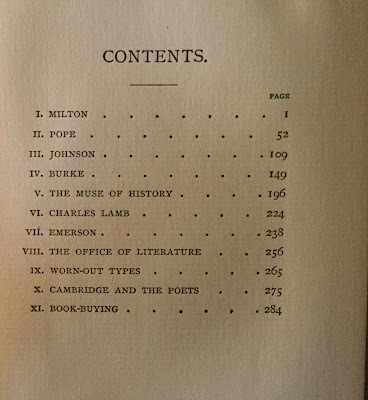 In 1930, Chatto and Windus published a book of Birrell's essays: Et Cetera. 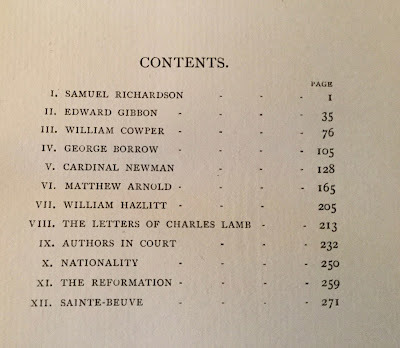 I particularly enjoyed the essay about James Boswell, "Boswell Disrobed!" The last book by Birrell in my library is his autobiography, Things Past Redress, which was published in 1937 after his death. It is an ex-lib copy, but because of the information provided between its covers, it is well worth every penny I paid for it. Birrell devotes an entire chapter about Ireland, which you will read about shortly. 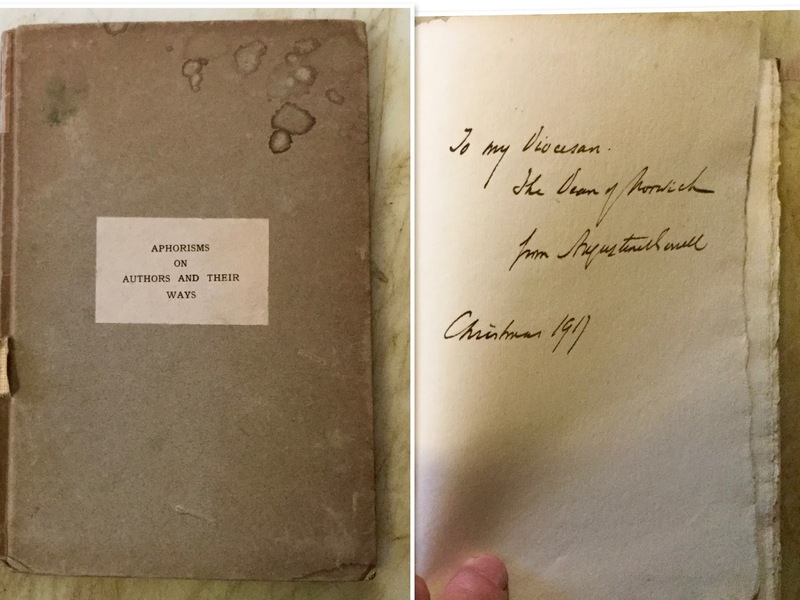 I would be remiss if I did not have a copy of the character sketch of his father-in-law, Frederick Locker-Lampson, that Augustine Birrell wrote in 1920. A copy from Zubal Books is on its way! I seem to be in the early stages of developing an offshoot collection of Frederick Locker-Lampson. 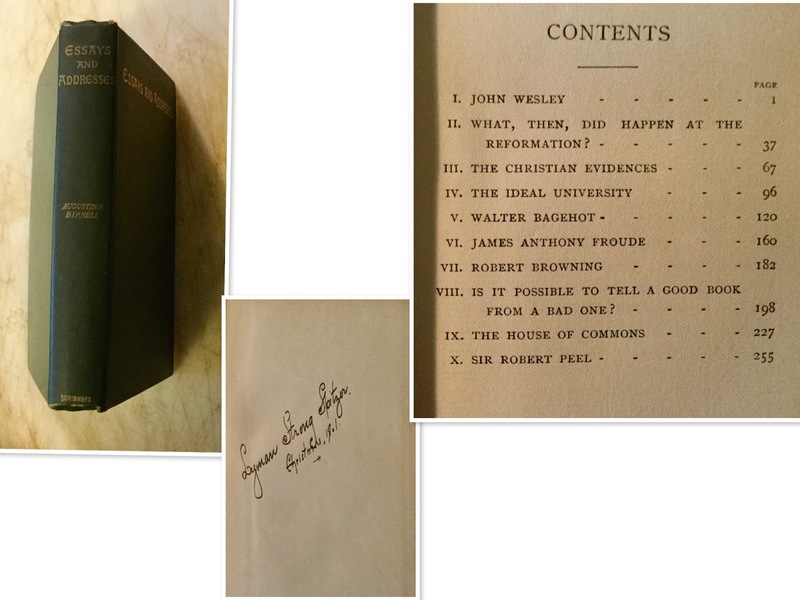 My Australian friend, the Johnsonian, John Byrne "traded" me a copy of Alfred Tennyson, Frederick Locker and Augustine Birrell: A Talk Given to the Rowfant Club by Sir Charles Tennyson on 28 September 1962. And just recently I acquired a Locker-Lampson A. L. S. for my autograph letter collection. 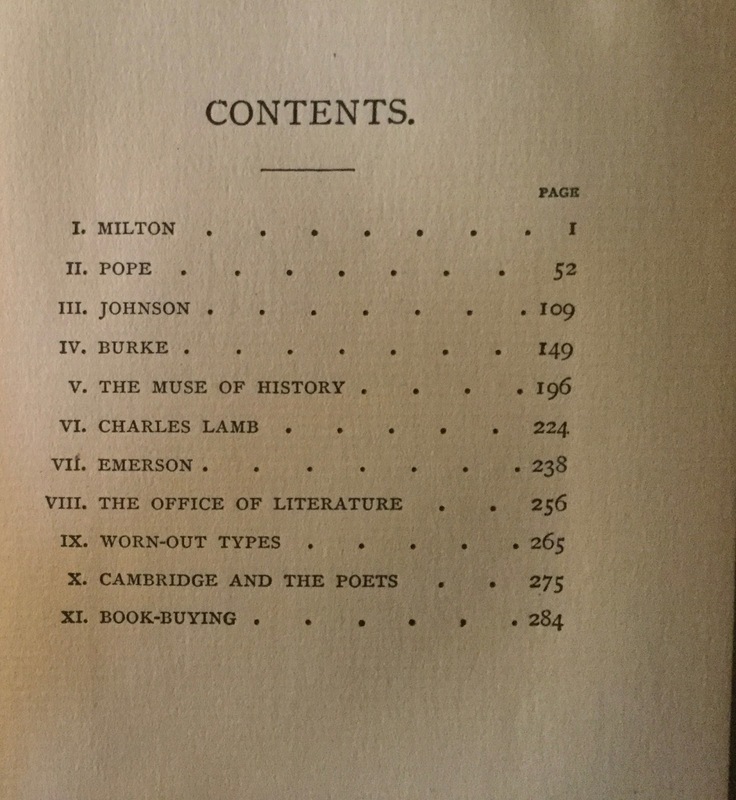 Locker-Lampson was requesting four copies of his book, London Lyrics, from his publisher, Kegan Paul, Trench, Trubner and Co. I should mention that I am not a "completist." 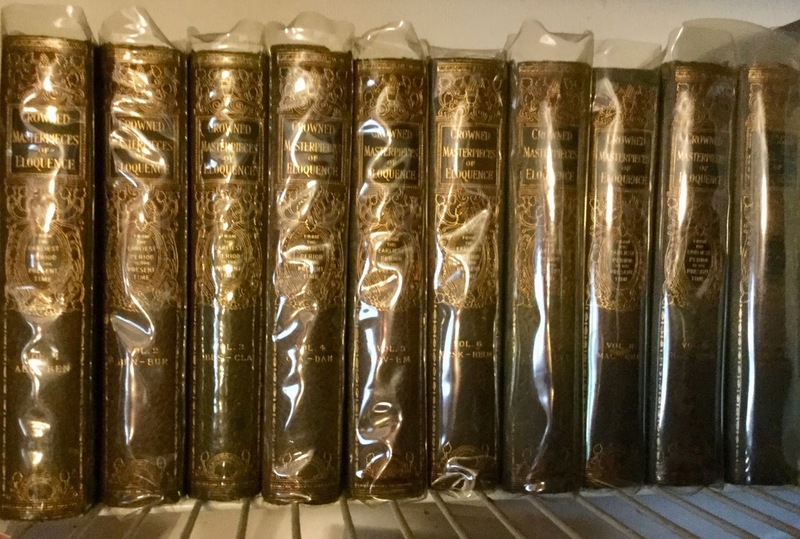 There are a few books Birrell wrote that I don't "need" to have in my library: his books on Bronte, Hazlitt, Marvell, and Lockwood. 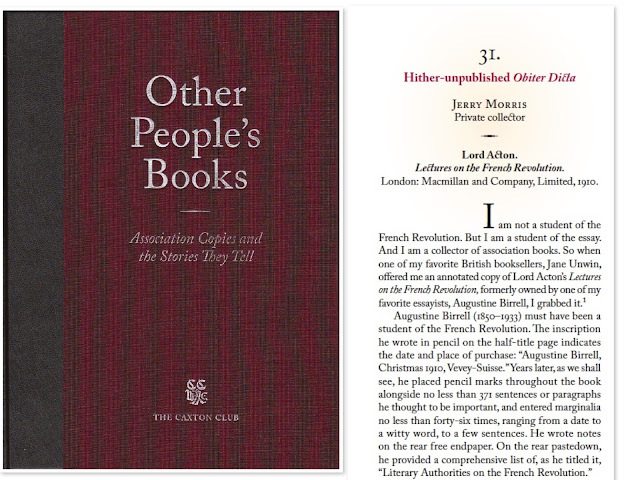 There are a few other books that contain essays previously published in book form. eg: Stock's Collected Essays, 1899 contains the essays in the two Obiter Dicta books. I am fortunate to have three books in my library that were formerly owned by Augustine Birrell. The Coming of the Friars and Other Historic Essays by Augustus Jessopp, London: T. Fisher Unwin, 1889. 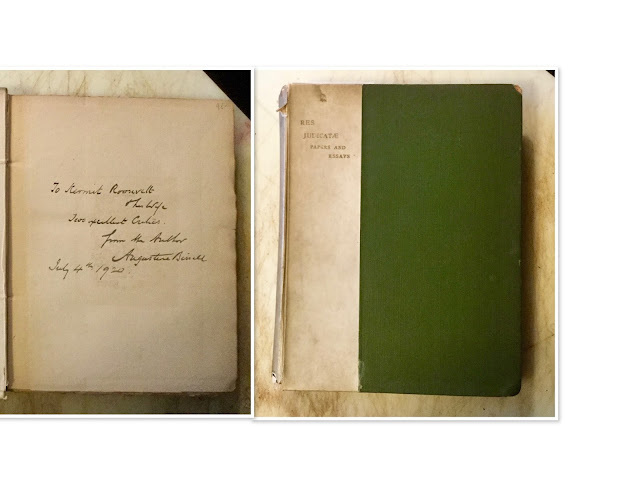 This copy first belonged to Augustine Birrell and then Vincent Starrett. In 1941, Christopher Morley found it in the Argus Bookshop in Chicago. I wrote a blog post about this find in April 2009, Birrell, Starrett, Morley, But Who is O.M.? The book itself is in the state of semi-repair (I need to replace the endpapers). 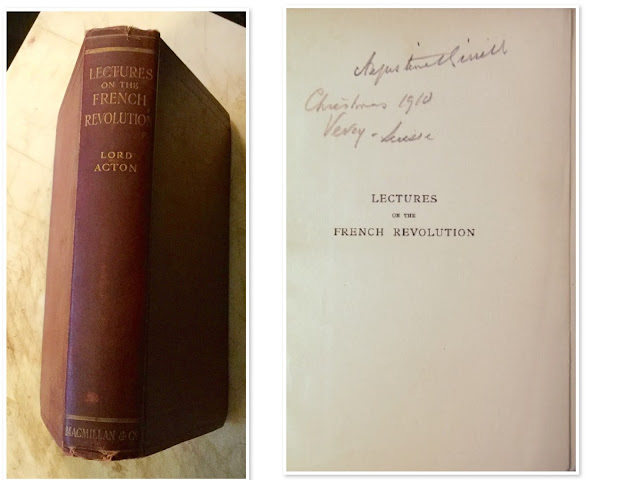 The third book in my library formerly owned by Augustine Birrell is his annotated copy of Lord Acton's Lectures on the French Revolution, London: Macmillan and Co., 1910. 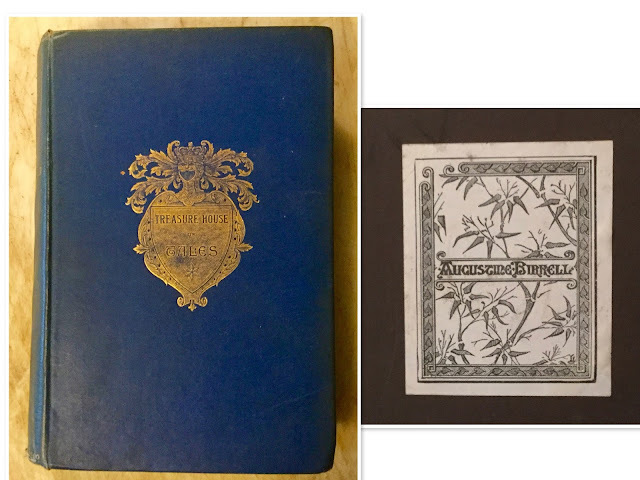 Birrell bought this book in Vevey-Suisse in 1910. 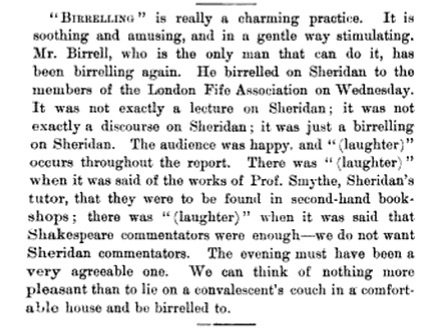 Birrell "entered marginalia no less than forty-six times, ranging from a date, to a witty word, to a few sentences." In the very first paragraph of this post, I mentioned Augustine Birrell being the Chief Secretary of Ireland. And I bought Birrell's copy of Lord Acton's Lectures on the French Revolution specifically for that reason. But Birrell did not become the Chief Secretary of Ireland overnight. His political career actually began in 1885 and 1886 when he twice ran unsuccessfully for a seat in the House of Commons. He was elected to the House of Commons in 1889, was re-elected in 1892 and 1895, but was defeated in 1900. In his autobiography, he referred to his years in Parliament "as the best years of my life." In 1906, Birrell was back in Parliament, but not for long. In February 1907, the Right Honorable Sir Henry Campbell-Bannerman appointed Augustine Birrrell the Chief Secretary of Ireland, a position he would retain until the Easter Rising of April 1916. 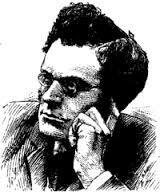 Birrell made his first blunder after his initial briefing on Ireland. He declared "that Ireland had never been in so peaceful a state for the last four hundred years!" Naturally, when the Easter Rising occurred in 1916, the blame was placed on Birrell and he was sacked. As Chief Secretary, he should have known what was going on in Ireland. 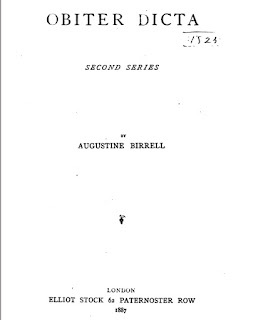 Augustine Birrell acquired Lord Acton's Lectures on the French Revolution in 1910. And he wrote his thoughts about the book's contents in the margins. I wondered if Birrell applied anything he learned about the French Revolution to the situation at hand in Ireland. 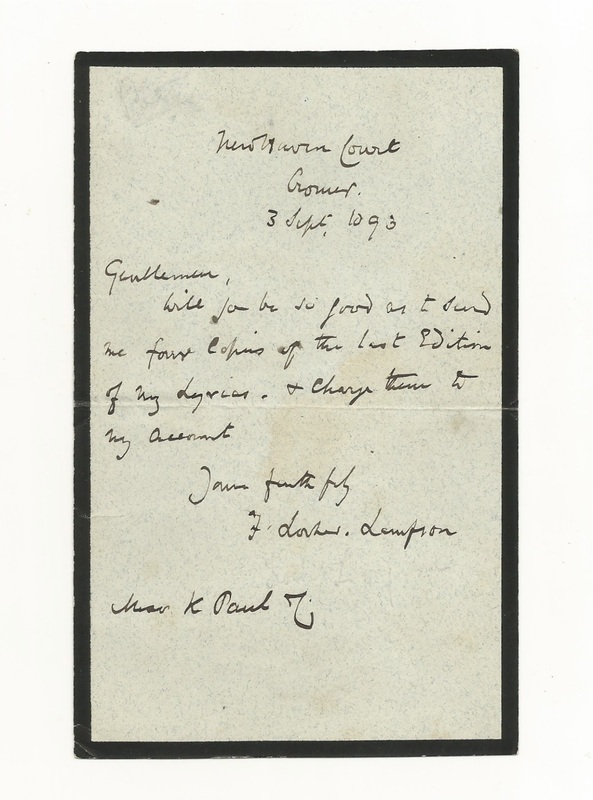 But it appears that Birrell did not pay much attention to Lord Acton's book until after he was sacked in 1916. 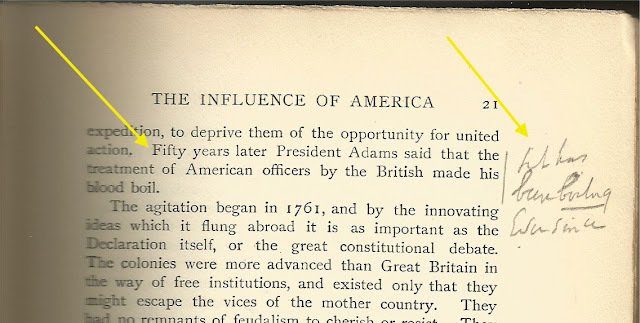 Although Birrell acquired the book in 1910, the earliest dated marginalia entry is from 1919. Augustine Birrell was Chief Secretary of Ireland from 1907 to 1916. He was successful in his first four years, particularly in making gains in Irish education. But he was bogged down with his wife's medical problems afterwards. In 1911, Eleanor Birrell was diagnosed with an inoperable brain tumor. In his book, Turning Points of the Irish Revolution, B. Grob-Fitzgibbon reports that all Augustine Birrell wanted to do at the time was to retire to England with his wife. But, with a war going on, that was not to be. Birrell and his wife remained in Ireland. And Birrell lost interest in Ireland's problems. His wife died in March 1915. As for Augustine Birrell, I believe he retreated to that same depressed state of mind that enveloped him after the death of his first wife. 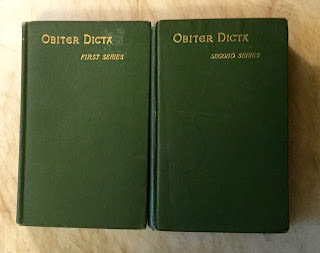 I wrote about Birrell's marginalia in an essay, "Hither-unpublished Obiter Dicta," that was published in the 2011 Caxton Club book: Other People's Books: Association Copies and the Stories They Tell. As of this writing, Oak Knoll Books had at least twenty copies of this book still available. "Things past redress are now with me past care."